Come Join Us, Reconnect With Friends, Network With Other Alumni, and Have Fun! Mark your calendars! NECC alumni and friends are invited to join the college on Wednesday, May 8 for a special fundraising event at UNO Pizzeria and Grill, 30 Cushing Avenue, Haverhill. For every food or drink item purchased on this day only, UNO will donate up to 20 percent of proceeds to the Northern Essex Community College Foundation, Inc., which supports student scholarships and critical academic resources on campus. We hope you’ll join us for this great cause! Please be sure to download and print an UNO DoughRai$er Ticket (PDF) in advance — and bring along extra copies for your friends! Can’t make it, but still want to help out? Take-out orders will also apply! 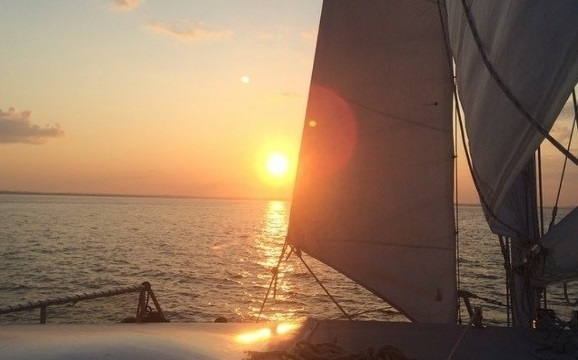 Join the NECC Alumni Office for a special three-hour sunset cruise aboard the Ninth Wave Catamaran out of Newburyport, MA! This is a private charter with a limited capacity. A total of 48 tickets are available for sale. Heavy finger food and non-alcoholic beverages are included in the price. A cash bar is available for 21+ guests. Attire Recommendations: Attendees are encouraged to avoid wearing heels while on board and to bring along extra layers of clothing as needed. Join the Alumni Office for a family friendly Lowell Spinners baseball game. Tickets include premium seating and a 90-minute all you can eat buffet prior to the game. For more information or to reserve your ticket, visit the Alumni Lowell Spinners Baseball Game and Barbecue page. The Seventh Annual Campus Classic 5K, offered in conjunction with NECC’s Third Annual Homecoming, will take place on Saturday, October 5, 2019. Participants of the 5K can run or walk the USATF-certified course through NECC’s picturesque Haverhill Campus and surrounding neighborhoods, cheer on their friends as they race to the finish line, or enjoy any number of activities and programs that will be available on campus throughout the morning. Register for the Campus Classic Today! The Homecoming, which will open following the 5K race, is open to all alumni and friends of NECC. A schedule of events will be released at a later date. Check Out More Community and College Events!